On the occasion of the recent bicentenary of the French Civil Code in 2004, this book reassesses the influence of this essential element of European private law. 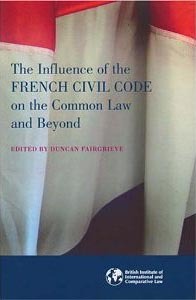 Contributions by distinguished jurists from the judiciary and academia examine the current role of the Civil Code within the French system, as well as its impact beyond the borders of France in other countries in Europe and beyond. Particular examination is made of the influence of the Napoleonic Code within Common law countries. Authoritative contributions in both English and French offer theoretical and practical perspectives from both common law and civil law jurisdictions. "The Influence of the French Civil Code on the Common Law and"